The fridge was sad and pathetic this past week with nothing that resembled dinner or anything that could become dinner. I was gone most nights this week, but my sister was scavenging for lunch and dinner options. This recipe came from Sunflower Market﻿. My cashews of choice are Trader Joe's Chili Lime. As I've mentioned before, there aren't any TJ stores here in Colorado, but periodically I travel somewhere where I can restock. 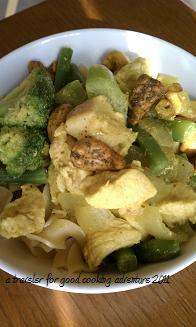 These cashews added a little extra kick since I didn't use especially spicy curry powder. Bring half the milk to a simmer in a large skillet over medium-high heat. Whisk in the curry powder and salt, working out any clumps. Stir in onion and garlic and cook for one minute. Stir in the remaining coconut milk plus water, and then the chicken. Cook down the liquid for 10 minutes on low before adding the beans and broccoli. Cover and simmer for 5-10 minutes, or until the chicken is cooked through and the veggies lose their raw edge. Remove the skillet from heat and stir in the cashews. Serve with rice, pasta, or straight up.